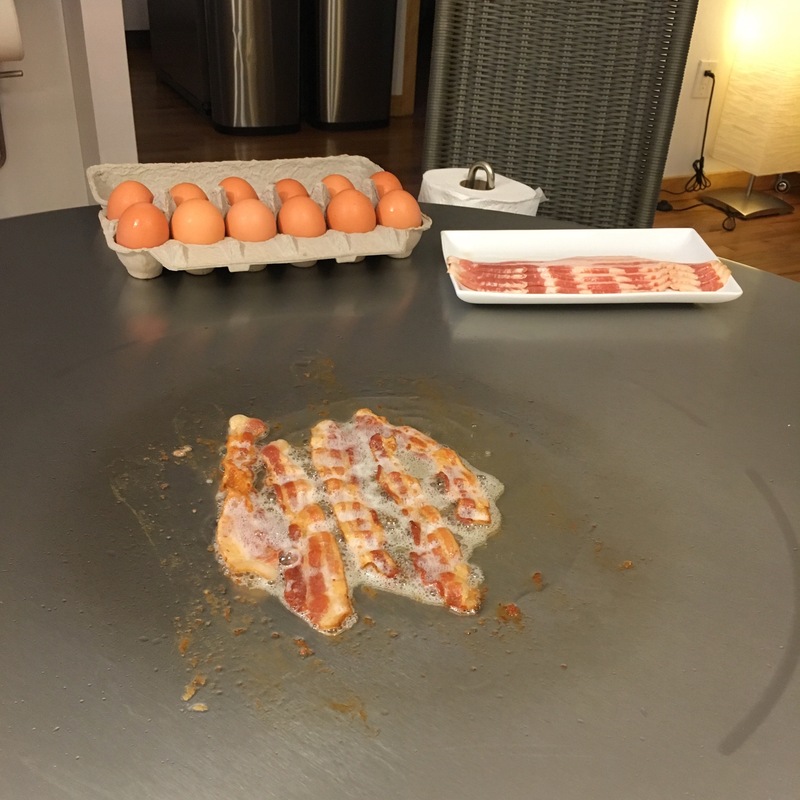 Good Ol’ Bacon & Eggs on the Teppan-grill – Teppanyaki Beyond Stir Fry. 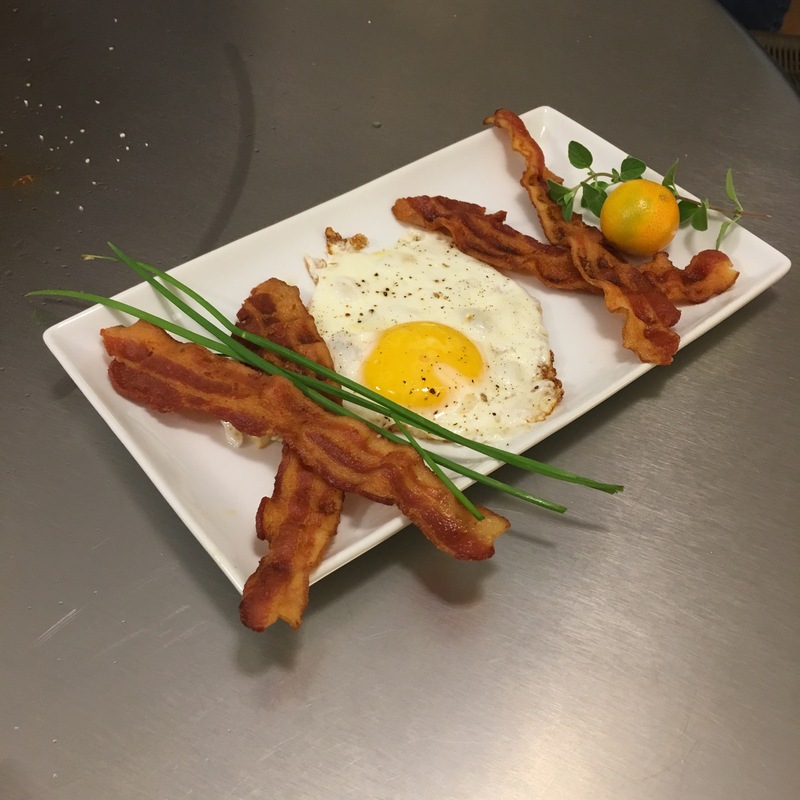 The simplest recipe of them all, and it’s a classic; bacon and eggs. That’s pretty much all you need! 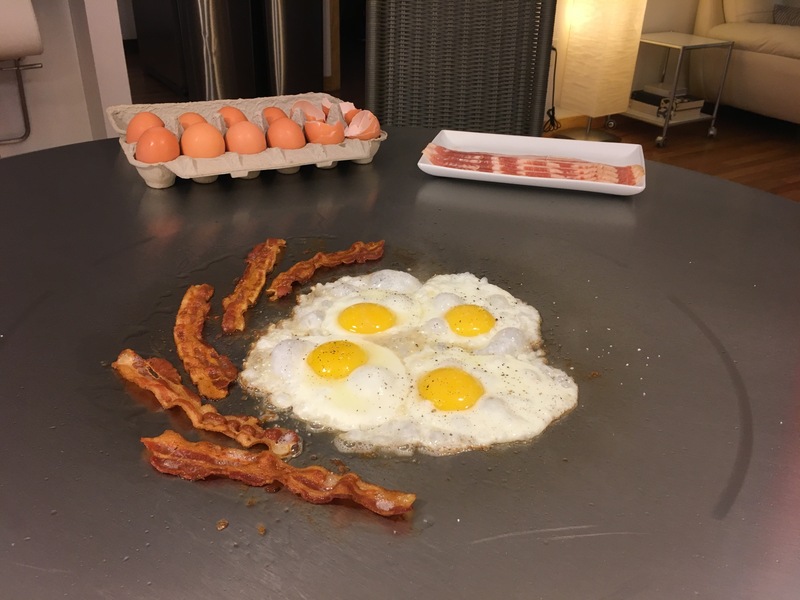 On the Cook-N-Dine teppanyaki cooktop we set the temperature to 8 after preheating at 5, which proved to be the perfect temperature for cooking the bacon and eggs to perfection without any burning. 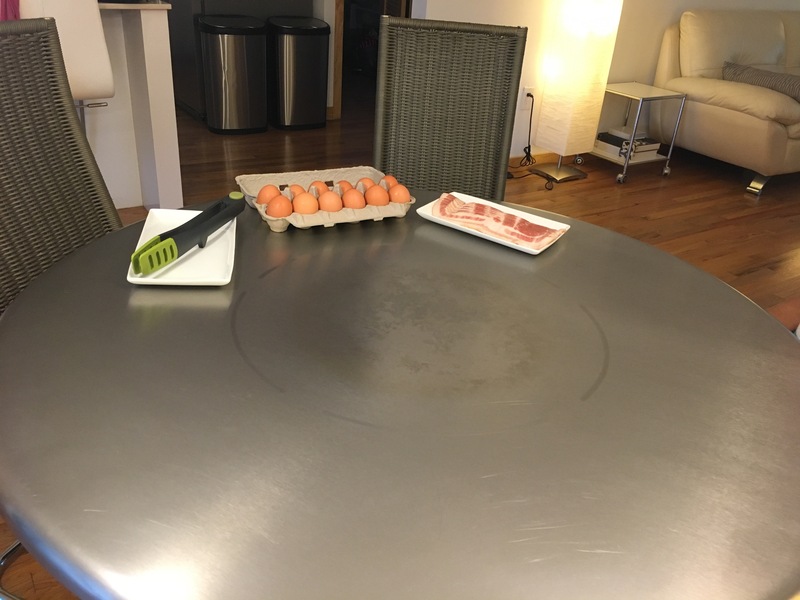 On a regular cooktop with a skillet this would be a medium-high setting. The sizzle was excellent as we placed the bacon on the Cook-N-Dine. The video may give you a good visual on the amazing sizzle, but you’ll have to use your imagination for the smell which provided a delicous umami that made our mouths water instantly. Within a few minutes the bacon was aquiring that beautiful golden color, starting to get to that perfect level of crispyness. After about 10 minutes of cooking and flipping the bacon, the sizzle had diminished but the smell and crispy factor were perfect which means it was time for the pièce de résistance: the eggs! We sopped up a bit of the excess bacon fat before cooking the eggs, but left some on there so that our eggs would have enough to cook without sticking. This provided some more sizzle sizzle, which is always fun! We chose to cook these eggs sunny side up for about 4 minutes, but you can flip them halfway through for an over-easy/medium cook if you prefer. A simple dash of salt and pepper, and those eggs were ready to go! Even this simple and classic dish can be dressed up a bit on the plate for a beautiful presentation. Some fresh herbs and fruit add a nice touch of color. You could also serve these with tomatoes or avocado. Even better, try them out with the Crispy Potatoes from our previous post! A hearty yet simple and delicious breakfast at home, what a perfect way to start the weekend. Guten appetit!